Last February, I was in Haiti as part of a #Bloggers4Haiti trip on behalf of Heart of Haiti, a “trade not aid program” developed by the Clinton Bush Haiti Fund and Willa Shalit in partnership with Macy’s to promote sustainable income in the arts for Haitians. Our trip began in Port-au-Prince and took us to the southern coast to the lovely ocean side town of Jacmel which is known for its papier-mâché. While touring the different papier-mâché studios, I looked outside the window and saw this woman. There she was seated alongside the street, making fresh friend plantains one of my most favorite treats! As my mouth started to water, I grabbed my camera to capture the process of making them street side. For less than a $1 we bought a bag to share and they were just as fresh and delicious as they looked. On my first night in Addis Ababa, I was introduced to the main staple of Ethiopian food: Injera. 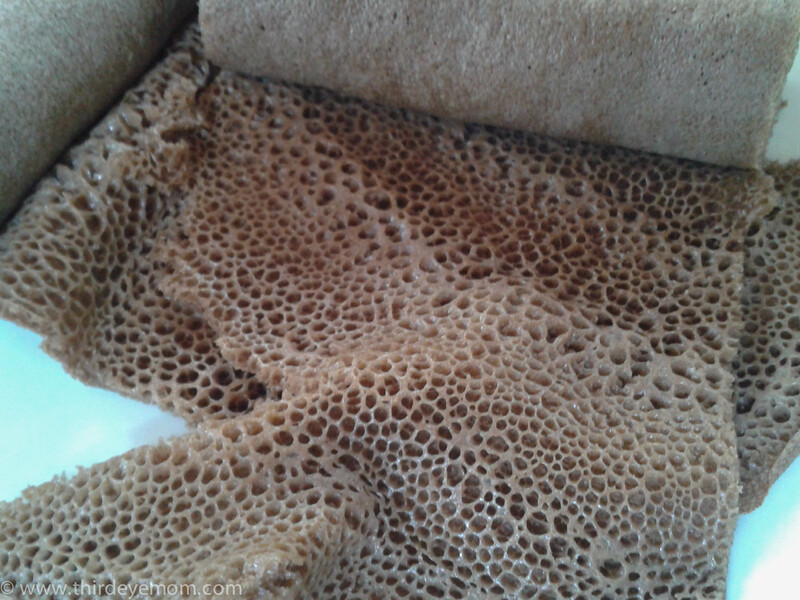 Injera is a sponge-like, sourdough bread made from teff that looks like a giant textured pancake and is used to scoop up different types of usually spicy Ethiopian stews called wat. 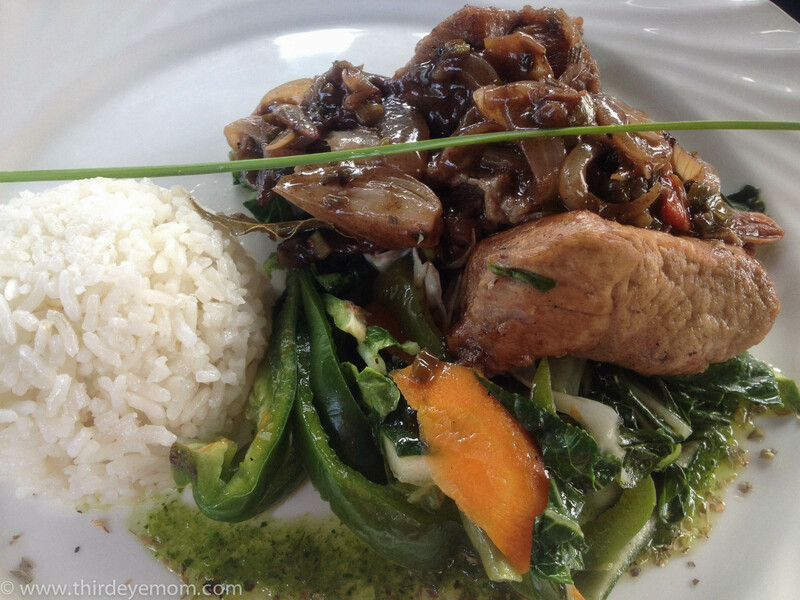 Although I have dined at Ethiopian restaurants before in the States, I was truly looking forward to the real thing in Ethiopia. I find that generally ethnic food is best and spiciest when you have it in the motherland. Injera is the traditional meal of Ethiopia and neighboring Eritrea and is exceedingly healthy as it is full of iron thanks to the teff grain. It is made by combining teff flour with water and the mixture is fermented for several days giving it its sourdough base. Once the mixture has completed this process, it is baked on a large clay plate called a mittad over a hot fire and formed into a spongy, big pancake. Injera up close. You can see its spongy texture. When you dine at a traditional Ethiopian restaurant or home, the first thing the waitress or host does is brings over a large bowl of warm water and soap to the guests to wash your hands. Since Ethiopian food is shared and everyone eats from the same big plate, having clean hands and using only your right hand while eating is proper etiquette. The injera is spread out on a large platter with a few pieces ready for to grab. Then the various wats (either vegetarian or meat spicy stews) are poured on top of the injera one at a time. This week’s photo challenge is to capture a photo or set of photos which are taken from above an object. Just coming back from France, I could hardly resist these photos I took looking over some of the beautiful, delightful things I saw in the world of haute cuisine and fresh produce stands. Beware….these photos are certain to make you hungry! One of the oldest traditions in the region of Savoie is making cheese. Three alpine cheeses are made in this region of the French Alps: Abondance, Beaufort, and Comte. These cheeses evolved over time due to the unique, isolated community of alpine herders who collectively used their dairy supplies during the summer months to make large cheeses that were easy to transport down the valley into the markets. After four days of hard work hiking the highs and lows of the sensational French Alps, we finally found salvation: Refuge de l’Aiguille Doran. Known as one of the best, more luxurious refuges in Vanoise National Park we were in for a heavenly night of fine wine, chef-prepared french food and delight. I could hardly wait! Lucy and I hit the pavement hard in the morning, walking and taking pictures as if we were on some kind of crazy photography marathon. Lucy lives in Antigua. However, I only had one full day to see as much of this amazing city as possible. And, amazing Antigua was. I was completely captivated by everything I saw. Every step was a photographic moment. Every building had a story to tell. 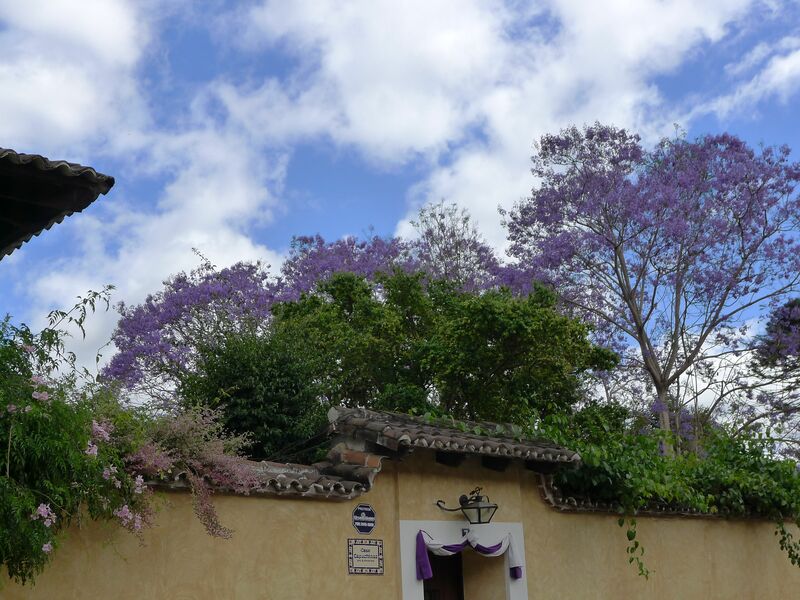 The rooftops were often in a spray of blossoming flowers in hues of purples, pinks and white. The peeling paints telling the tales of centuries ago. The missing cobblestones making each street a unique albeit tiring journey. The mysterious volcanoes. Threatening and looming off in the distance. The colorfully dressed indigenous people. Everything was a Kodak moment. The problem was there simply wasn’t enough time. 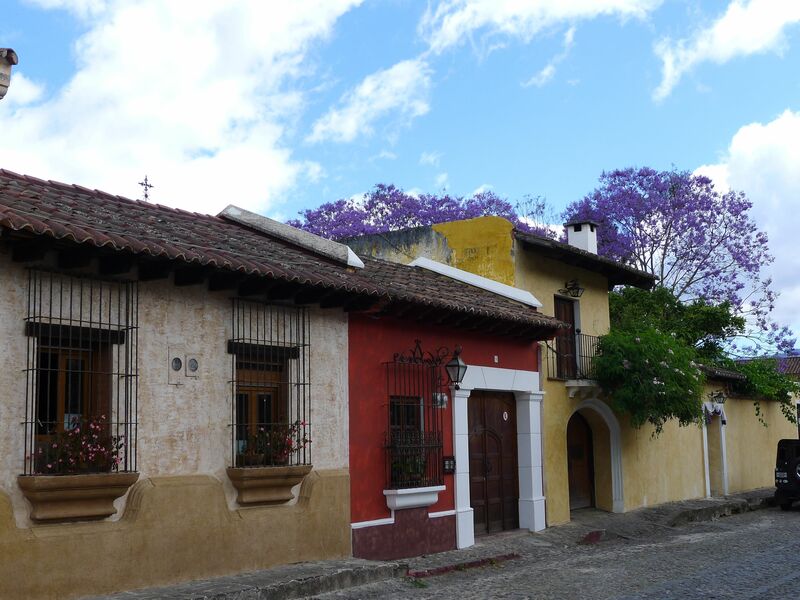 Beautiful typical buildings and homes. 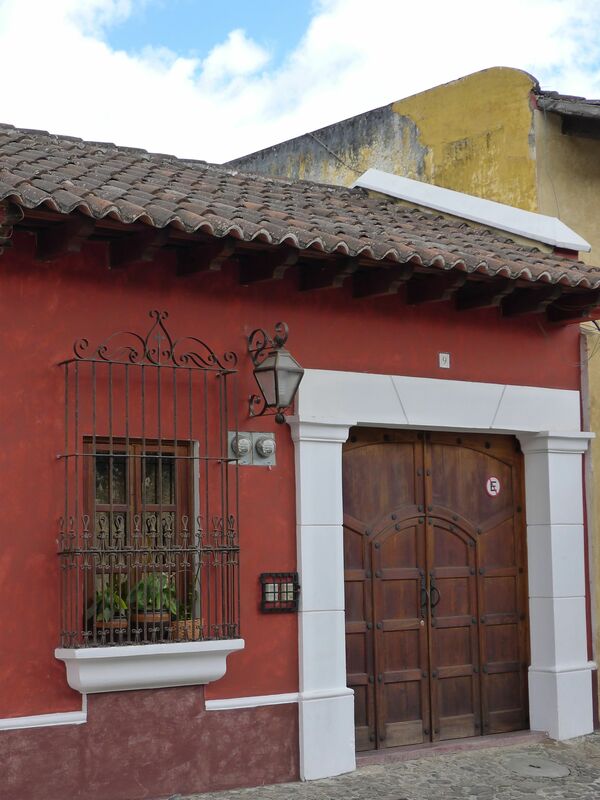 There are many streets like this in Antigua.